Does rapid renewables expansion necessarily mean higher electricity prices? Grattan Institute’s latest report suggest rapid expansion of renewable capacity means higher electricity prices. But is that true? Perhaps one of the many points coming out of the Grattan Institute’s latest report is the idea that rapid expansion of renewable capacity must necessarily mean higher electricity prices. But what has been the experience in Europe over the last five years during which there has been a rapid expansion of renewable capacity in most European countries? The Council of European Regulators compiles useful information on retail and wholesale electricity prices. Here is a table compiled from their data, which shows their estimate of average wholesale electricity prices (in Euros per MWh) in 2008/9 and 2014 in various European countries. The table above show substantial price declines. It might be argued in response that since gas is the marginal fuel in most countries, this is reflecting the impact of lower gas prices over this period. Maybe, but that is not the whole story. The rapid expansion of renewables has also driven declines in wholesale prices. This is well documented and the last few years has seen many venerable European power houses split themselves into the energy equivalent of a “good bank” and a “bad bank”, with the carbon-intensive generators sequestrated in the “bad bank” to manage their decline, and the “good bank” freed of the dead-weight to capitalise on the huge opportunities in renewables. So, be wary of categorical statements about the expansion of renewables and higher electricity prices. The rapid expansion of renewables in Australia may, as in Europe, not necessarily translate into higher electricity prices. Instead the expansion of renewables may be funded in large part by the wealth rushing out from carbon intensive electricity production. Carbon intensive producers will of course not like this, but reducing emissions must mean that it is not profitable to produce them, there can be no two ways about it. In fact, to the extent that it does not occur this way in Australia, policy makers, consumers and the community might ask why. Australians want strong climate action – so what are we waiting for? It is very obvious, as is pointed out in the tables, which fortunately go back enough years to give a good caparison, now that renewable energy is in the market, that the Gattan Institute is perhaps false with the idea that RE increases prices. I am going to look at my link to Gattan and see what they say. 1 Demand charge to reflect household demand of power. The schemes have reduced emissions, but at a very high price. There are much cheaper ways to tackle climate change. Setting a 50% renewable electricity target in South Australia appears foolish when it is not clear that the electricity system can handle that level of intermittent wind and solar power. These events in one state were a canary in the coalmine, warning of the risks in our power future. It is time to listen. So my summation of the Gattan Institute is this. Basically they do recognize that the energy supply industry has to reduce CO2 emissions, however to reduce the cost to the end user consumers who have large demand of power should pay for it. This would cover the AC unit that you switch on when you get home. As to just how using Renewable Energy should cost more totally eludes me, because the cost of energy input is zero. I totally agree with a review of the market because it has been shown that it is easy to game the price for supply and put it up with no questions asked. If you let the AC run from the solar on your roof, you let 20% of the incoming radiation that would heat up your house do the work of actually moving the heat out of your house right when it is needed most. FiT don’t incentivize this kind of behavior currently. So you come home to a cooled house when it’s done right. I’m sure there’s some difference and, as you say, I can run my, reasonably efficient aircon for free,reducing peak power requirements (and prices for those without solar). As I recall, there was a report to the Abbott government that showed a moderate increase in prices up front, due to capital investment but lower prices down the track due to zero fuel costs. This makes sense to me. Well…the observation that wholesale prices have been falling in many countries in Europe with a strong renewable policy is interesting, but actually misleading. In Germany, for example, wholesale prices at the electricity exchange EEX have been dropping because renewables enter the auction with a negative price, thereby making sure that all renewable energy will be sold. This mechanism has even led to negative wholesale prices on occasion, when demand on a Sunday is low, the sun is shining and the wind is stronger than forecast. The conventional power plants burning brown and black coal are slow (and costly) to ramp down, so the operators keep them running. To think that somehow electricity has been produced free of charge is, of course, incorrect. The difference between the wholesale price and the guaranteed feed-in tariff for wind and PV is being paid by a fund, which is in turn replenished through an occasionally adjusted surcharge on the RETAIL electricity price. Households mostly pay the bill, as some industries managed to get exemptions from the surcharge, unfortunately. While I am all for renewables, we have to admit that subsidies in the form of feed-in tariffs have indeed increased electricity prices. Still much cheaper though than bearing the consequences of unmitigated climate change, that is certain. Prices go negative in Queensland with virtually no wind and not a lot of solar because of the ramping issues you mentioned. It is also true that very high German FIT’s have added to domestic electric costs however the FIT trust fund is in surplus and because renewable costs have been falling, even domestic prices have started falling. In the meantime most of the large industrial users have seen even larger falls than in the chart above. Wholesale prices in Germany are now around Euro 30 considerably cheaper than nuclear powered France. As Peter says, you don’t have the full picture there. JWW it is true to suggest that some part of the renewable subsidy is, in some cases, being picked up outside of the wholesale market. But practices on this in the European countries vary. In aggregate the wholesale effects are more significant than offsetting policy payments however, so the observations I made are robust to this. Perhaps even more importantly, the remarkable reduction in capital costs (partly through technology improvement and partly through reduction in the cost of capital) is largely up-ending the historic argument that substituting new for old would result in higher prices. I do agree with you that in general, more renewable does NOT mean higher electricity prices. Especially in sunny countries like Australia. Prices for PV power have dropped at such a rapid pace, it is truly astonishing. When I started to work in PV, we were talking module prices of 5 EUR/Wp. Now modules are selling at 0.40 USD/Wp at the factory gate in China. However, to come back to my original criticism, the added cost through policy measures in Germany, ie. 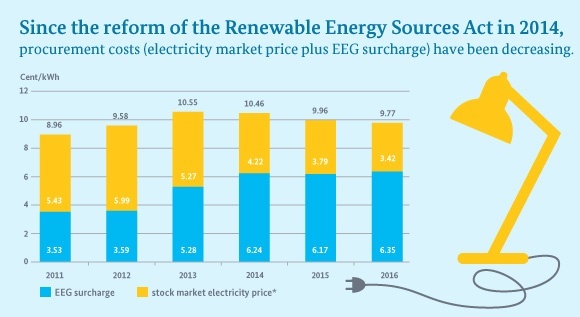 renewable subsidies (“EEG-Umlage”), has been around 60 EUR/MWh from 2013-2016, while the wholesale price has dropped from 53 EUR/MWh to 34 EUR/MWh in the same period. That means that the cost of subsidies is now almost double the wholesale price. All I want to say is that we need to be careful when we are just looking at the wholesale price. We almost don’t need to ask. The carbon emissions business is a most profitable business assuming you can make people believe the gas spike is the fault of undeveloped renewables. But this also relies on certain incumbent interests telling lies, and them also attempting to create influence with regulators into being anti-renewable. The fossil fuel incumbents like Origin Energy have been pushing the line that higher renewables = higher prices for the last decade. That conveniently necessitates a move into gas as the logical transition choice for Australia. But a cursory look at Origin Energy’s share price shows a collapse over the last decade, with the collapse accelerating in the last five years. Clearly Origin’s strategic logic has been fatally flawed at enormous cost to shareholders. Maybe time the Grattan Institute stops pushing “gas is the answer” type analysis and use some of the facts well published by Bruce Mountain here. Fossil fuels are only viable here in Australia today because of ongoing taxpayer subsidies, like no price on carbon pollution, no real requirement to do effective rehabilitation, the diesel fuel rebate, subsidised water and no charge for the health costs of toxic air pollution. They also pay less than normal shire rates. Gas price like all fossil fuels are cyclical, we have now passed the trough and now we are on the upswing. Lets check your comment in a year and see if its still valid. It’s common knowledge that the switch to renewables is reaping havoc in social economics, especially at the lower echelons of our society. Why? Retailers boosting their prices in order to maintain profit margins, which hits the consumers who aren’t able to afford solar or wind. Germany has the highest rate in power disconnections, despite it being the frontrunner in renewables in Europe. Government lacks the framework of catching the ones falling through the cracks…. Monopolies are wreaking havoc on societies. “common knowledge” doesn’t mean anything. The price increases were mostly due to overinvestment in the grid, due to Howard era policies encouraging privatisation. Ie, if the owners spend the money, they were granted, pretty automatically, price increases at a high rate of return to cover the costs. It’s the grid owners who are making most of the money. The generator owners are cleaning up for short periods when there are real or manipulated electricity shortages. One of the ways that renewables reduce the cost of all power is to drive down the price of gas and coal. Only a small amount of displacement is necessary to force coal and gas to compete on price. So declining fuel prices do not explain away the decline in power prices; rather, that is precisely how renewables are driving down power prices. falling on my small block. Its getting easier to tap into.